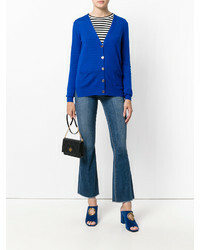 A dark green coat and blue flare jeans worn together are a covetable getup for those who prefer ultra-cool styles. Let your styling chops really shine by finishing off your ensemble with brown leather flat sandals. 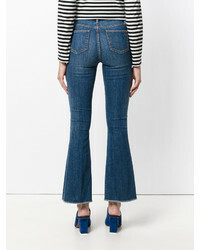 Show off your sartorial chops in a beige dress shirt and Tory Burch Ryan Frayed Flare Jeans from farfetch.com. When not sure as to what to wear when it comes to shoes, add dark brown leather heeled sandals to the equation. 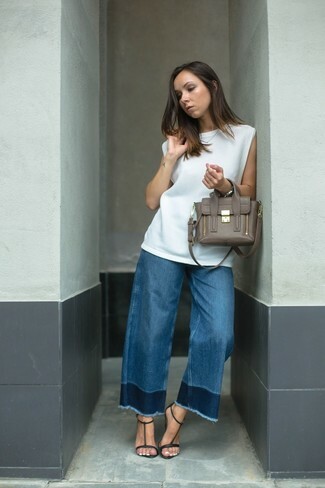 Pairing a white horizontal striped off shoulder top with blue flare jeans is a nice choice for a laid-back look. 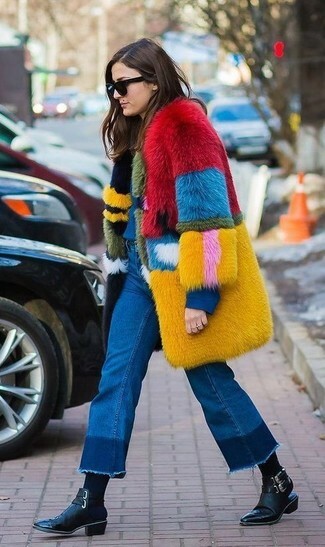 Breathe style into your current styling routine with a multi colored fur coat and Tory Burch Ryan Frayed Flare Jeans. Complement your look with black leather ankle boots and the whole look will come together. 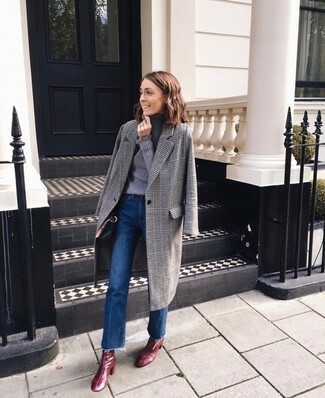 Try pairing a grey plaid coat with blue flare jeans to achieve new heights in your personal style. Balance out your getup with a smarter kind of footwear, such as these burgundy leather ankle boots. You're looking at the hard proof that a black leather biker jacket and Tory Burch Ryan Frayed Flare Jeans are amazing when married together in a casual getup. Black leather pumps are a surefire way to give an air of class to this look. 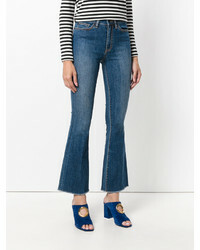 Consider pairing a white sleeveless top with Tory Burch Ryan Frayed Flare Jeans from farfetch.com to pull together an interesting and current casual outfit. Finishing off with black leather heeled sandals is the simplest way to inject an added dose of sophistication into this getup. If you feel more confident in comfy clothes, you'll fall in love with this incredibly stylish pairing of a grey poncho and Tory Burch Ryan Frayed Flare Jeans from farfetch.com. And if you wish to instantly perk up your outfit with a pair of shoes, why not complete your outfit with a pair of beige leather ankle boots? This combo of a grey check double breasted blazer and blue flare jeans combines comfort and functionality and helps you keep it low-key yet current. A pair of pink leather heeled sandals instantly dresses up any ensemble.